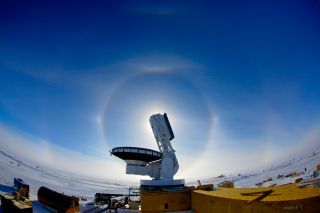 South Pole Telescope in profile, with sun dog (arc and rainbow), caused by ice crystals. Antarctica may be the bottom of the world, but the coldest, driest, highest continent is the best place for looking up at the heavens from Earth. Next week marks the 100th anniversary of humanity first reaching the South Pole, when Roald Amundsen planted the Norwegian flag there on Dec. 17, 1911. Astronomy in Antarctica will soon experience a centennial of its own — the very first meteorite discovered in the Antarctic, the Adelie Land Meteorite, or ALM, was found on Dec. 5, 1912. "I regard the discovery of the ALM as the start of astronomy in Antarctica, which will thus be 100 next year," said astronomer Michael Burton at the University of New South Wales in Sydney. "Amazingly, the South Pole now ranks with the grand research laboratories such as Fermilab and CERN," said theoretical physicist Francis Halzen of the University of Wisconsin-Madison. The aurore australis over the Dark Sector at Amundsen-Scott South Pole Station. The Dark Sector is so-named due to the absence of light and radio wave interfence. The bright spot above the ground shield in the foreground is Jupiter. The white streaks of light going up are the Milky Way. The Antarctic is a land of harsh extremes, ones that make it perfect in many ways for astronomy. "There's a whole range of things you can do in astronomy at Antarctica that you can't do anywhere else on Earth," Burton said. "To beat Antarctica, you'd have to go to space. The good thing about Antarctica compared to space is that once you get something in space, you can't expect to change it, while in Antarctica, you can always build it bigger." Antarctica is the coldest continent, meaning there is less thermal radiation to hamper astronomy that focuses on infrared light. This cold also makes Antarctica the driest continent, freezing liquid water on the ground and water vapor out of the air. As such, there is little water present to interfere with light coming from outer space that astronomers want to observe. Antarctica is the highest continent — its icy surface rises gradually from the coast to a vast plateau, and the area of ice more than 9,800 feet (3,000 meters) high is nearly as large as Australia. This elevation also makes Antarctica the windiest continent — gravity pulls air off the plateau, and the so-called katabatic winds that result can reach hurricane speeds at the coast. Still, there is little wind on the highest points of the plateau, and the calmest spot on Earth in terms of wind speeds and lack of major storms can be found there. Overall, the stable nature of the air there is ideal for steady stargazing. The South Pole lies on the flank of the Antarctic plateau at an elevation of 9,300 feet (2,835 meters). Here, the United States keeps the South Pole Telescope gazing at the cosmic microwave background — the oldest light in the universe — as well as millimeter-wave radiation from outer space. A new camera on the South Pole Telescope, SPTpol, "has the potential to help us learn about some of the most fundamental issues in physics, such as what was happening in the first tiny fraction of a second of the life of the universe," said astronomer Tom Crawford at the University of Chicago. During the first roughly 10 to the minus 34 seconds (0.0000000000000000000000000000000001 seconds) of the universe, the cosmos underwent rapid inflation, doubling in size at least 90 times, Crawford said. This was the most cataclysmic disturbance of space-time ever, generating ripples known as gravitational waves that stretch and compress matter throughout the universe. By carefully studying the imprint these gravitational waves leave on the cosmic microwave background in terms of the intensity of its light and the way in which the light wiggles, one can learn more about inflation — "why it would have happened, or what the dynamics are," Crawford said. The BICEP-2 and Keck instruments in Antarctica are hunting for this inflationary signature as well. Astronomical activities are also under way at other sites on the Antarctic plateau, including China's Kunlun Station, Japan's Fuji Station and France and Italy's Concordia Station. Space science even takes place above the continent — balloons launched in Antarctica analyze belts of radiation encircling the Earth known as the Van Allen radiation belts. The vast amounts of pure ice in Antarctica make it ideal for absorbing and studying particles from outer space. For instance, the largest neutrino telescope in the world, IceCube, is built 1.2 miles (2 kilometers) below the Amundsen-Scott South Pole Station, and "transforms deep ice into the largest particle detector ever constructed," said Halzen, principal investigator of IceCube. Two other projects are currently under development to investigate mysterious particles at Antarctica, Halzen noted. The Askaryan Radio Array will monitor radio waves emitted by extremely high-energy neutrinos passing through the Antarctic ice to try to identify the enigmatic sources of cosmic rays — electrically charged particles from outer space — while Dark Matter-Ice will use crystals buried deep in the ice to try to directly detect particles of dark matter, the invisible unknown material that makes upmore than 80 percent of the universe's mass. Antarctica is also the richest source of meteorites on Earth — anything that comes crashing from space is readily apparent on the otherwise featureless surface, and the cold keeps the meteorites frozen in nearly pristine conditions. Antarctic meteorites include rocks that were blasted off Mars long ago by other space rock impacts; analyzing these meteorites could shed light on whether the Red Planet could have ever hosted life. The cold, dry nature of Antarctica makes it like Mars in some ways, and much research takes place in the Dry Valleys there to test equipment that could one day find use on the Red Planet. For instance, NASA's IceBite project tested ice-penetrating drills for potential future missions to the Martian polar north. Scientists also see the Antarctic ice as a testing ground for missions to icy worlds such as Jupiter's giant moon Europa. To figure out how to breach its thick icy shell to reach what might be a vast ocean buried underneath, NASA has explored ice-covered Lake Vostok and Lake Bonney in Antarctica. Life found in such icy environments raises the chance that we might find life on Europa as well, scientists say. South Pole Telescope science team leader John Carlstrom. Although the South Pole has an infamous history, claiming or nearly ruining the lives of many explorers, astronomy in Antarctica is now far easier than one might suspect. "We're not traveling with dog teams or on foot fighting weather," Burton said. Crawford said, "I was actually surprised at how reasonable the working conditions were at the South Pole. Though it was very cold — minus 40 Fahrenheit (minus 40 Celsius) — when we were building the South Pole Telescope, there is very little wind, and working outside for a full 10-hour day was not a crazy proposition, as long as we took regular warming breaks." A new South Pole station was built in the last decade that helped make life there significantly less challenging. "Thanks to the excellent research infrastructure, doing science at the pole has become almost routine," Halzen explained. As such, "it's not like you have to go down there, pitch a tent and cook your own food — the scientific community gets a lot of support at the U.S. bases," Crawford said. "As long as you wear the right clothes issued to you by the U.S. Antarctic Program, and are smart in keeping yourself warm, it's not too much different from building a telescope anywhere else." Although telescopes in Antarctica are currently scanning the sky for microwave and millimeter-wave radiation, the Antarctic plateau could also be ideal for observatories that monitor other parts of the light spectrum as well. "China is currently the main driver in developing the most promising of these sites," Crawford said. China is building Kunlun Station at the highest point at the Antarctic plateau at an elevation of 13,395 feet (4,083 m). Chinese researchers have ambitious plans for telescopes that work in the optical, infrared and terahertz ranges, Burton noted. Australia is collaborating with them, and has already set up a robotic observatory there, he added. "I think it would be a good idea for U.S. groups to support China's efforts as much as possible and take part in them if we want to remain a leader in Antarctic astronomy," Crawford said. "There's going to be exciting work there in the future."